American Expat in the Philippines. 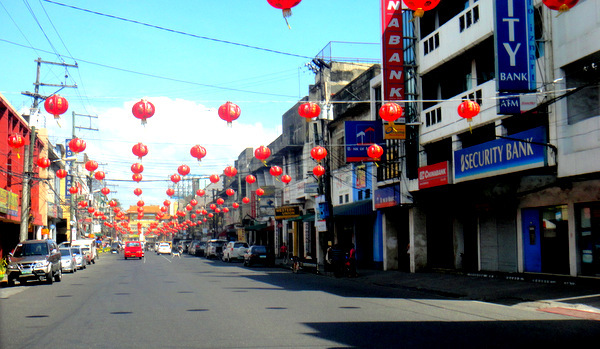 Iloilo City. Retired. Lazy. Everybody does everything for me. Well, almost everything. I do pee on my own. Living in “paradise.” Getting older. The Black Forest cake from the Red Ribbon bakery at SM City (see next photo) was purchased by my asawa to celebrate my recent 61st birthday. But I don’t mind getting older. I’m one step closer to collecting my Social Security. While we didn’t have all the bells and whistles that the recent Chinese New Year celebration in Iloilo had, as shown in the next shot, we had a fair amount of merrymaking. Our twin nieces, April and Michelle, and nephew Sharwen and niece Shaina were at the party. Since they live with us, I thought they might as well attend the festivities. We didn’t take a cruise to celebrate. 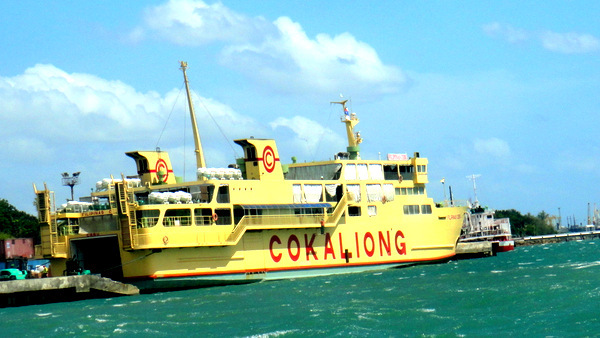 The following vessel, the Cokaliong, that I always see at the Parola Dock in Iloilo, doesn’t carry passengers. But we are planning a trip to Bacolod, “The City of Smiles,” soon. It’s the most populous city in Western Visayas with 511,000 residents, and my asawa and I have never been there. Should make for a good mini-vacation in the Philippines. 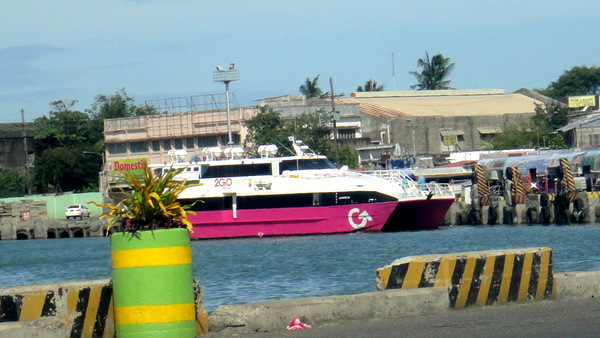 We’ll take a 2GO Travel cruiser from Iloilo like the one depicted below to get to Bacolod, about an hour from Iloilo. But it was cake and ice cream along with a spaghetti dinner to celebrate my recent birthday. I was happy with that. We don’t need to go out and spend a lot of money on some fancy shindig. Next year, however, is a different story. 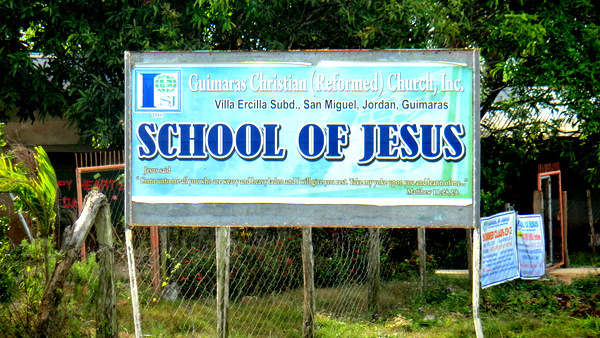 While we probably won’t be attending the “School of Jesus” in nearby Guimaras (which actually might not be a bad idea), I will be treating everyone to a big birthday bash at Pizza Hut or Shakey’s. Good thing I’ll have that extra cash from my Social Security then because I’ll need it. Both these pizzeras aren’t cheap. And I’m all about living as frugally as possible in the Philippines but sometimes you have to let loose and have some fun. 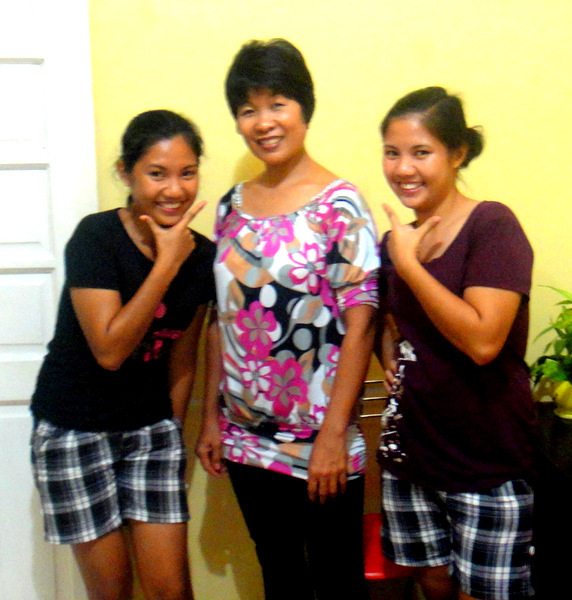 Here’s April on the left standing next to my beautiful asawa, their Tita Daday. Michelle is on the right. The twins are using the classic pose that they think means they’re cute. I call it the “L” for “loser’s” pose. 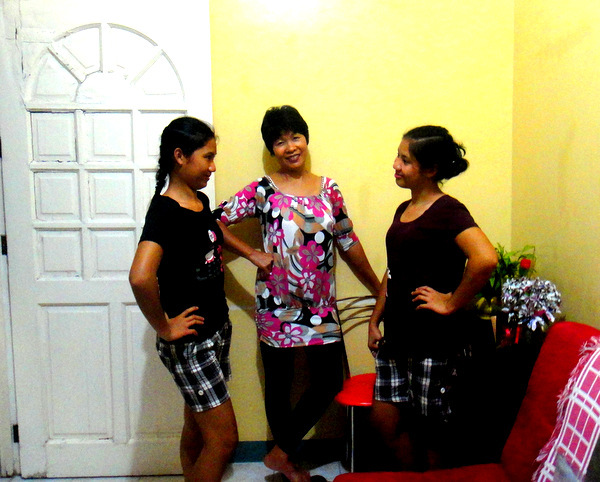 And the picture above depicts April and Michelle in a posing standoff with tita. I don’t know which twin won. April might weigh a little less than her sister, but she’s still tough. They both can’t keep up with Dad, however. I might be 61 years old but I smoked both of them in a fast-walking competition the other night. I had gone out to the main gate in our Savannah Subdivision to surprise my asawa and the twins. They had gone out to buy some vegetables and fish at the local market. Nothing was on television and I was getting bored. My other niece and my nephew were at home but they’re about as quiet as a Cistercian monk. Frankly, I might as well be talking to the wall. The trio approached the gate. They turned a corner and they spotted me. Told them I was bored and decided to help them carry their groceries home. I grabbed one of the heaviest bags that was full of vegetables. Soon April and Michelle passed the old man up. “Go ahead of me,” I said, “you’re both 42 years older than me.” I let them walk ahead of me before I kicked it in. I soon passed Michelle and edged her off the sidewalk onto the main road. Then I briskly walked past April. It wasn’t long before I was way in front of the crew. My own asawa wisely did not compete. I heard the group making comments in their native Ilonggo, but I paid no attention to the “trash talk.” I ended up five minutes ahead of everyone. Not bad for an old man. Now that I’ve caught my breath, days later, I’ll close with this last photo. 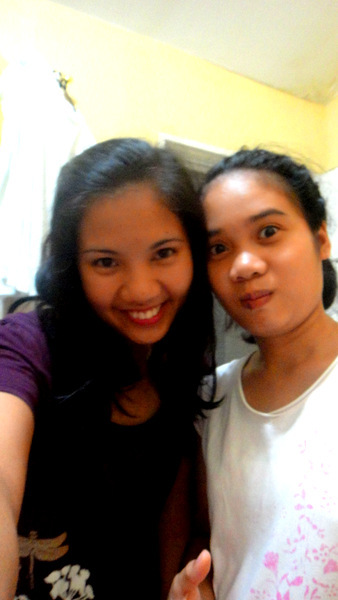 It’s Michelle and Shaina, in one of her lighter moments. This American expat in the Philippines is getting older. And I’m loving it. ← Filipino Don King Spotted on the Guimaras Jeepney? Thanks, Scott H. I appreciate it. Thanks much, Lance the Canadian. happy brithday I just turned 62 on the 28th but Im waiting for a bigger check. Thank you Don, and Happy Belated Birthday to you. I’m cashing in early, Don. Well, for my Social Security that is. I hope there’ll still be money in the government coffers to go around for all of us. Thanks, PapaDuck. Would be great to celebrate our birthdays together next year. Maybe we can work that out. Happy Birthday, Dave… I am one of many avid readers of your blog. Like you I am awaiting my 62nd birthday to begin my new life as an expatriate with Social Security pension. Your blog and others have been duly/unduly helpful with my decision to take the plunge. You’ve got quite a headstart from me. Again Congratulations on your 61st Birthday! Give my regards to the painted sainted wife and your extended family as well….. Thanks for the comment, Eric, and for the birthday wishes. Always good to get a new comment from someone that reads the blog. I appreciate that. Good luck on your upcoming retirement. Glad my website and others out there have helped you in making your plans. I’ll pass your regards on to my boss and the rest of the family. Thanks. We may grow older Dave but I for one refuse to grow up. Life just keeps on getting better!! Happy Birthday friend! we cnt celebrate his birthday together. Wish all the best to you and to your family. Thanks, Anne. I’m very fortunate to have Melinda with me. PapaDuck will be back soon. I know it’s hard for a loved one to be away. 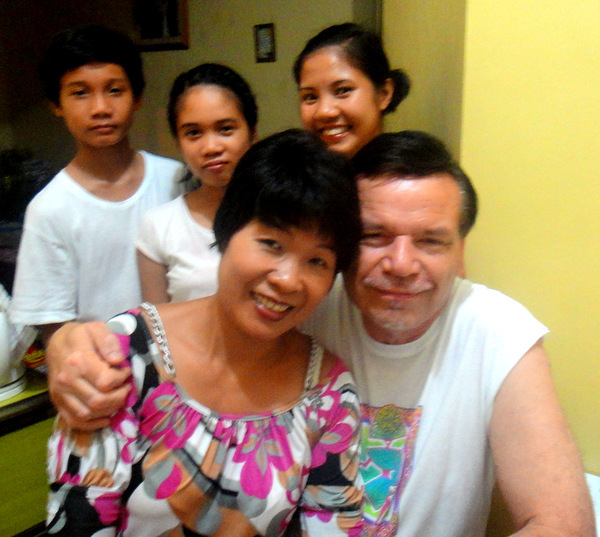 It took nine months for Melinda to join me in the States after we were married in the Philippines. Hope the time passes by quickly for you both. I’m almost sure I wished you a Happy Birthday already…maybe I was early? But just in case I’m wrong…HaPpY BiRtHdAy again! Have a Red Horse on me! 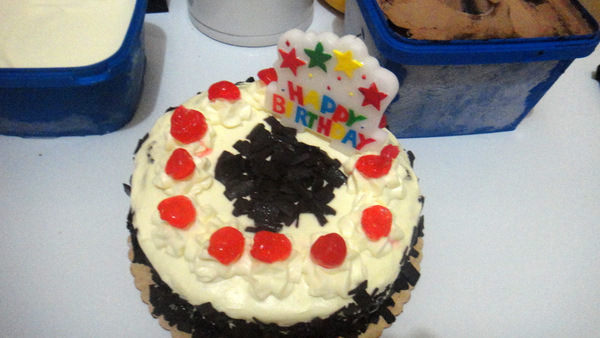 I only hope I can celebrate my next B-day living in Samar. Have fun in Bacolod! Thanks, Tom W. I appreciate it. It’s great having all this free time, isn’t it? Sure, keep me posted on the next outing you have. Thanks and take care. Happy Birthday again, Dave. When we get older we need to be reminded so 2 birthday greetings isn’t bad. I’m a year behind you, having just turned 60, but unlikely to retire till 65. In the meantime I’m returning to PI next month so life is a blast! Happy Birthday Dave!!! Wish you many more to come in the Land of Smiles. Thanks, Todd. I appreciate it. Take care. Hello Dave.. I thought I was registering to get E-Mail notification of new posting. I was surprised to see my reply on your new blog. And I was even more surprised to see that I had erred in addressing Melinda also known as “Tita Daday, aka “The Asawa” aka “The Sainted Patient Wife” as the painted sainted wife. Forgive me for sullying your smarter half’s nom de guerre. My bad, I hope to get off by maybe with this letter of apology and probation for time served. Thanks..
No problem, Eric. My asawa IS “the painted sainted wife” when she slaps on her warpaint for our shopping visits to SM City. Sorry about the mix-up on the e-mail notification. Thanks for covering my six, Dave. Apart from what’s going on in D.C., the coldest winter yet in Omaha. I am more determined to start practicing what you had been preaching! Democrat Obama is putting entitlement programs on the table despite the Democrats objection.. Like you say, I hope Social Security stays solvent when I reached 62 the earliest age we can collect/retire. Not much money. BUT. Cold days.. Warm beach… I’ll take warm beach any day.. Happy Birthday again, Dave. Yes, I recently read about Obama putting so-called entitlements like Social Security on the table now, Eric. Problem is, those “entitlements” are benefits that millions of seniors like you and I have paid into for decades. How about cutting benefits for those millions of illegal aliens that our tax dollars support and foreign aid to countries that detest us? There’s even a large contingent of Filipinos that don’t want us here. Why not pull out all of our aid and let the Philippine Navy deal with the Chinese on their own? The future doesn’t look too good for us seniors, I’m afraid. But our plan “B” will still enable us to stay in the Philippines despite what our so-called “leaders” in Congress do. Thanks for the birthday wishes again, Eric. Guess I’ll just have to sit back and enjoy another San Miguel or two. Gary, I agree that the system is going broke. Even if the massive fraud in Social Security and Medicare was cleaned up, that would still not leave enough money to fund everything. I’m glad you were able to take advantage of the Medicare benefits. My Dad is making those monthly Medicare payments, too. I realize that something has to be done to fix the situation. Hopefully, both parties can reach some kind of workable solution. Frankly, I have my doubts. Dave, the beauty of an open forum like yours, it goes off in any direction. Today.. Dow is at all time high, despite the gridlock in Washington it has gone up. To this date none in Wall street has gone to jail for that fiasco/market crash in 2008. Bailed them out with our hard earned taxpayer money. They still have their hands out, we subsidized big corporations that pay little tax or no tax at all. I’ve been waiting for some of that trickle down economics come my way…wait..waiting.. Dave, break out some cold San Miguel while I wait.. Debt ceiling, fiscal cliff, sequester, gridlock… bipartisanship/compromise anyone in D.C. think this might actually work. Dave, I am still thirsty. I really don’t stick to topic or care if any of my readers do, Eric. Any new person that leaves a comment, will have their remark held for moderation first. If I find their input to be in poor taste, I will not publish it. I don’t like personal attacks and I’m fortunate to have a good bunch of readers, like yourself, that do leave remarks. I’ll have a cold one, for you, Eric. Nothing beats an icy cold bottle of San Miguel Pale Pilsen on a hot, sunny day in the Philippines. Come to think of it, even a lukewarm one is OK.
Dave, speaking of icy cold. The weather here in Omaha is a blistering 37 degrees feels like 31 when you consider the wind chill factor. Tonight a low 22 with a 40 percent chance of snow/mix with sleet and rain…Welcome to my world.. Lukewarm San Miguel sounds good!! In the past months surfing the web, I’ve considered Boracay as my retirement destination, but like any tourist destination in the world they will charge you as much as the market would bear… Phuket and Cheng-mai were tempting. Closer to home,.. Belize, Mexico, Nicaragua, Panama, and Ecuador, conclusion: further research needed. Manila was briefly considered along with Cebu. I’ve mellowed out too much to consider Subic Bay/Olongapo and Clark/Angeles City. Smaller cities was researched and considered. My choice is the city of Ilo-Ilo in the island of Panay. My siblings from San Francisco, Sacramento, San Jose, and Los Angeles all says “Hey, E. Good Luck with that” I don’t know what to take of that. Were they sincere or being sarcastic??? It is now 32 degrees outside..feels like 28 to me.. See you later, Dave. Eric, my asawa has plenty of relatives in the Metro Manila area. Too big for me. Too much traffic. Too many people. I can get small town flavor in a big city such as Iloilo City. I never wear a jacket. Never have to shovel snow. Plus, our subdivision will have a groundbreaking ceremony next month for a new grocery chain store and Jollibee’s that will be opening here. What more could I want? I don’t why you got the reaction that you did from your siblings, but I think Iloilo is worth a visit. Take care and keep warm. Hello PapaDuck… Thanks for the input! My research included the pros and cons of owning and/or renting. I am not quite sure where I am with that, yet. I’ve check Sulit Real estate from time to time, they show lots of apartments and houses for rent in Ilo-ilo. A condo by the river on General Luna St looks promising. A gated subdivision like Savannah is an option. I do not know if I want to live that close to “The Kano” whose website headquarters is a stones throw away from my laptop. By the way, Papaduck, must be nice not to budget your Social security pension. As for me I have a military pension and a small 401K. The Social Security will be my back-up for miscellaneous expense like pay as you go health care,etc.etc. To Dave DeWall, My 401K has not fully recovered from the crash. It is showing signs of ascending direction. Thanks again. PapaDuck, Dave for your input and support. Bye for now. Maraming Salamit sa inyong dalawa!!!! Eric, I’m sure you’ve read plenty of opinions from expats regarding renting or buying. We plan to buy. And we will pay cash. I don’t want my asawa to have to bother about making house payments once I’m gone from this world. It’s just our personal preference. We probably won’t be staying in Savannah. The latest plan is to look for a good bank repo and refurbish it. One of my American expat friends living in Iloilo did that and has a nice home now. Social Security? I saw on the news last night that Obama took a bunch of Republican senators to a posh restaurant yesterday and “entitlement’s” were discussed. I think anyone collecting Social Security or is planning to, has cause to worry. I would not be surprised at anything our government would do. Isn’t the President now allowing drones to attack and kill American citizens in the United States without any due process? Scary stuff going on. Hope your 401K recovers, Eric. The last couple of days in the market have been record breakers. Here’s hoping that trend continues. Dave and PapaDuck, Correction: Maraming Salamat sa inyong dalawa! Eric, I even considered Manila for a brief time also. But after our last visit there to get my Permanent Resident Visa, I had absolutely no desire to return any time in the near future. I’ll pass your regards on to Melinda and the rest of the crew, thanks. Upcoming news on two crew members coming up next post. HAPPY BIRTHDAY DAVE…BEST WISHES TO ALL!! Thanks, Andrew, I appreciate it. Take care. It’s a crap shoot, John J, waiting until 67 to collect Social Security, but I know the payout per month is better. Fortunately, I had a very good paying job at AT&T and my monthly Social Security allotment will allow us to live very comfortably in the Philippines when I sign up at age 62 next year. Plus, the current stock market’s good news (which won’t last I know) has been very kind to our present IRA. Life is good.